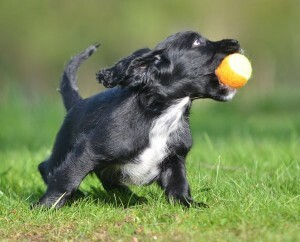 A lot has been written about all the great benefits of reward based dog training. Using positive reinforcement in training gives us happy dogs that love their work. The learning process accelerates as the dog uses 100% of her capacity to learn – and not trying to stay out of trouble or avoiding corrections. But are there no negative side effects of positive reinforcement? Why are some over the top aroused when you’re about to start an activity? Why do they make noise or show other signs of frustration in some exercises? When does the dog cross the line from being happy and eager to work to being “stressed”? The more arousing the activity is, like field trial work, schutzhund work or agility, the more important it becomes to prevent unwanted behaviors and too high levels of arousal. A goal of this training is to train the dog to be “thoughtful in drive” – to stay focused even when motivation is high without going over the top. Of course dogs have different genetic predispositions for how to cope with high expectations and high levels of arousal. But most of us love our dogs and want to train our dogs to reach their potential. So what can we do apart from buying a new puppy? Humans are creatures of habit. We tend to reward to reward the same behavior over and over, we feed the dog or take it for a walk at the same hours and follow the same routines when training out dogs. Dogs are fast learners and will soon start to predict what’s coming up next. If we meet the dog’s expectations over and over, the dog will start to “claim” its rewards with increasing intensity. These unwanted behaviors and high expectations and arousal can be easily prevented. Here comes a few tips. Vary what kind of rewards you use and how you use them. For example use calm rewards if the dog starts to get pushy about her toy, or use play breaks between sessions with food rewards. Feed the dog at different hours or in different locations. Let the dog sit and wait in situations where she is used to play or chase. Or vary if your puppy is allowed to go and see people or other dogs you meet or if you just walk past them. If your dog is claiming attention, any particular type of activity or reward, give her something else to do – or just ignore the behavior. This doesn’t mean that your dog shouldn’t take initiative to any activity, but keep a balance. In my opinion it would be crazy to remove all exciting rewards and activities if you have an easily aroused dog. Teach her what to do to start these activities instead. Preventing too high arousal and the possible unwanted side effects when using high value life rewards are an important part of gun dog foundation training. 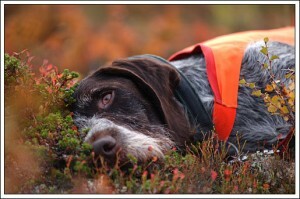 Thomas trains spaniels and pointers and has experience with retriever training as well. He will host a Field Trial Foundation Class starting January 21st. He will help you teach she skills needed as well as helping you find the balance between drive, control and relaxation for your gundog. Sign up here. I like this article very much. Preventing too high arousal and the possible unwanted side effects when using high value life rewards are an important part of gun dog foundation training. With these given tips, the unwanted behaviors and high expectations and arousal can be easily prevented in dogs. Dog lovers can benefit from all these tips.